Previously, the smallest brown dwarf - Solar System Planets And Moons Section. Previously, the smallest brown dwarf. Mini Solar system Around a Brown dwarf. NASA's Spitzer space telescope has found the dusty disc of planetary material surrounding an extremely low-mass brown dwarf. The failed star, called OTS 44, is only 15 times the mass of Jupiter, and is located 500 light-years away in the Chamaeleon constellation. 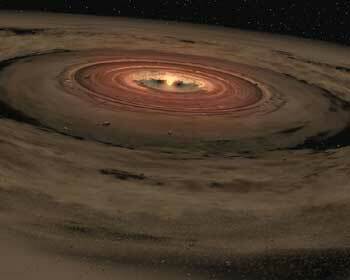 Previously, the smallest brown dwarf known to have such a disc was twice as massive. Astronomers are now wondering if a habitable world could form around such a small, dim dwarf. Astronomers from Penn State and Caltech have found the smallest extrasolar planet yet, orbiting a pulsar 1,500 light-years away. The small planet - the fourth discovered around this pulsar - has 1/5th the mass of Pluto, and orbits approximately the same distance as the asteroid belt orbits the Sun. The pulsar is spinning quickly, and gives off pulses of radiation at a very regular rate. Fluctuations in the pulses can then be used to calculate the orbits of planets going around them down to the size of large asteroids. This Star is Leaving Our Galaxy. Astronomers from the Harvard-Smithsonian Center for Astrophysics have discovered a star speeding out of our Galaxy at over 2.4 million kph (1.5 million mph). It's probably moving this quickly because of a close encounter with the supermassive black hole that lurks at the heart of our Milky Way. The star came too close, was captured by the black hole's gravity, and then hurled onto an exit trajectory. The star contains many heavier elements than Hydrogen and helium, so Astronomers believe it began life in one of the stellar nurseries near the galactic centre.